In the Ultimate Instant Restaurant round tonight, the teams need to cook two entrees, two mains and two desserts. 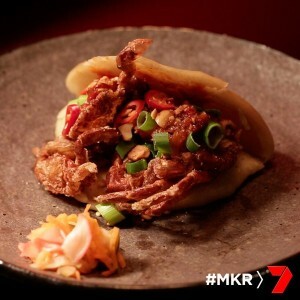 First up in the ultimate instant restaurant round is Tasia and Gracia in Melbourne. The girls arrive home in Melbourne and they are greeted at home by their family. The girls quickly catch up with their family and then head off to do their shopping. They are cooking traditional asian foods with a twist on it. For the entrees they are cooking crystal prawn and ginger dumplings and spicy soft shell crab with pickled vegetables. 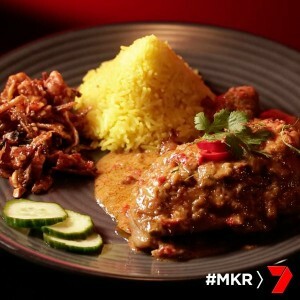 For the mains they are cooking beef rendang with coconut rice and Indonesian grilled chicken with sambal and tempeh. For desserts they are cooking a mango mousse with sesame nougatine and a sesame chocolate ball with pandan ice-cream. Their restaurant is Mortar as Pestle. It has an Indonesian theme. The girls get started on their mango mousse and the beef rendang curry. Gracia is working on the dumpling filling and the dumpling wrappers. Tasia is making a bao which is a Chinese bread. She then puts the pandan ice-cream into the freezer before. The guests arrive and are impressed with the setup of the restaurant. The girls get back to get into the kitchen and spend a little while talking and arguing about how to cook the rendang curry. Gracia is worried that the chicken dish might be too spicy. The judges arrive. The menu is revealed. Each team has to choose what items they would like. The girls get straight back into the kitchen to cook the entrees. They plate them up and take them out to the judges. Pete and Manu taste their entrees. Pete has the soft shell crab, he says they exceeded his expectations. It was crispy and covered in beautiful sauce and he was very impressed with the bao. Manu had the dumpling and said there was an explosion of flavour and he wants the recipe for the accompanying sauce. He is really looking forward to his rendang. The other guests taste their entrees. Lauren and Carmine really enjoyed their soft shell crabs. Laura comments that dumplings were not perfect. Anna comments that the soft shell crab was exceptional and Jordan says he was really impressed. The girls get back into the kitchen to continue to prepare their mains. They are happy with how the rendang is cooked. Gracia is cooking the tempeh and the shrimp paste sauce. Tasia adds coconut milk into the curry. Gracia puts the chicken under the griller to brown it up. They begin plating up and take their dishes out to the judges. Pete and Manu taste their mains. Pete has the chicken and Manu has the rendang curry. Pete says his meal was delicious and the chicken was very tender. The sauce was the star of the dish. He loved the tempeh. Manu says the rice was fantastic and he enjoyed the prawn cracker. He says the rendang curry was not as good as his mother in law’s unfortunately. Even though it is a dry curry he said the beef was a little bit dry and there should have been more sauce. 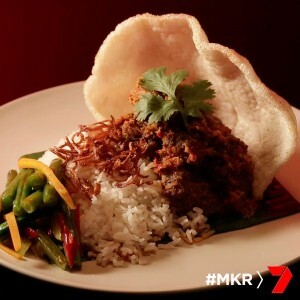 It is a good rendang but not a great rendang. The other contestants taste their meals. Some comment on how spicy it is. Anna says the dish is delicious. Jordan says he’s going to bottle up their sauces and sell them. The girls get back into the kitchen to finalise preparing their desserts. Gracia is making the sesame nougatine. Tasia is making the dough for her sesame chocolate balls. The dough doesn’t look right and they make a tester but it is still not working out. They are not sure what to do. They cut their tester open but the chocolate is burnt so they turn the oil down. 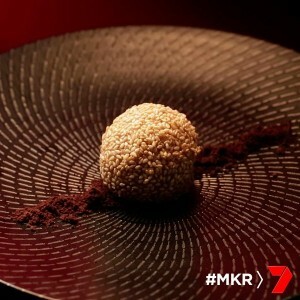 Manu pops into the kitchen as Tasia cuts open another test ball and it oozes chocolate perfectly. The girls plate up and take their final dishes out to the judges. Pete and Manu taste their desserts. Pete has the mango mousse and Manu has the chocolate ball. Manu says the ice-cream is to die for, really really good. The sesame ball is a little too doughy. 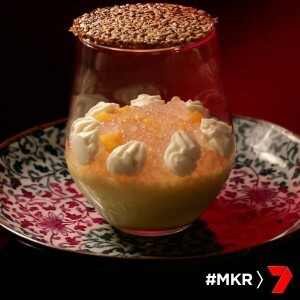 Pete says it’s the best asian dessert he’s ever had. The mango mousse was sensation and it had great texture. He says what can’t you do. The other contestants taste their desserts. Zana says her mango mousse is really good. Mitch says the pandan ice-cream was great but he wasn’t sure about the sesame ball. Jordan says the mango mousse was perfect. This is the highest score of the ultimate instant restaurant round ever. The next team to cook is Mitch and Laura. What does Zana have wrong in her meal? i love the food these lovely sisters cook!!! 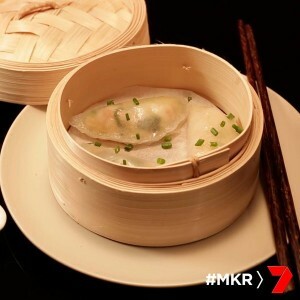 i am trying out a few of my favourite recipes from their list BUT i can’t seem to find a recipe for the crystal prawn and ginger dumplings with dipping sauce, i would so like to find this if it is out there?